One of my favorite bridal stores, Haute Bride, is having a sample sale! Save 10% on your custom designed veil. Save 15% on all Haute Bride designed accessories, including our B628 bracelet, chandelier earrings, our Spring 2009 Collection, during the trunk show. Book your appointment early for the sample sale. Save 30-50% on in stock veils. 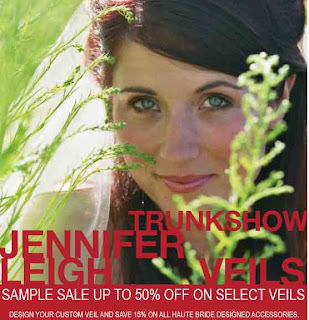 Jennifer Leigh veils are custom designed, and start at $80. Choose from face veils, Alencon lace trim, satin ribbon edging, rhinestone or crystal sparkles and more. Please call for an appoinment. Trunk show ends on April 28, 2008.